This large modern garden is an attractive and functional family garden. It's contemporary look and clean lines create a calm space, and within this calm space are fully functional areas for the family to use. From the large sliding doors of the kitchen you step out onto a deck made from composite decking boards, (these are hardwearing and easy to maintain), an area great for dining, sunbathing and entertaining. From here you step down onto an area of lawn bordered by raised sleeper beds. The beds are filled with with warm reds, pink and rusty coloured perennials and grasses creating a secluded and beautiful corner. 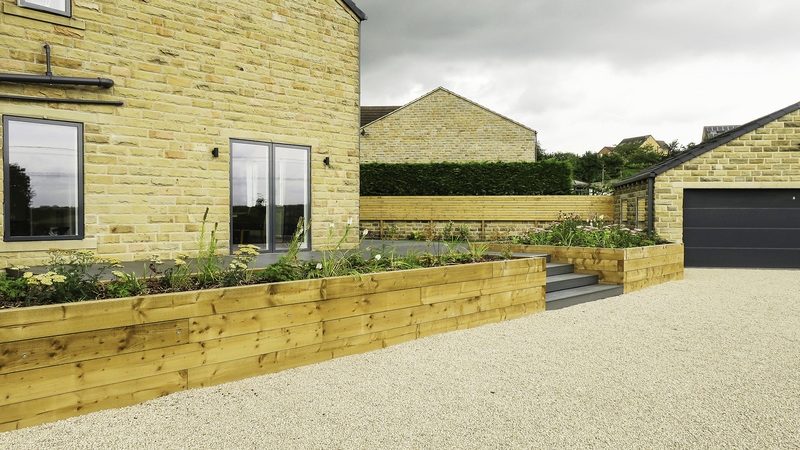 Against the wall bordering the neighbours garden a sleek horizontally boarded fence provides privacy and in the corner an area of porcelain paving holds the fire-pit for cosy gatherings. The clients have children and this garden has a larger area of lawn and a sunken trampoline where they can play. The lawn has borders of flowering shrubs on three sides. The clients also requested an area for parking and access to the garage, for this we used gravel held in place by a grid. We added a few Eucalyptus trees to act as a shelter belt from the wind, and are also attractive trees in themselves. A few other touches at the front of the property include several rows of cobbles at the drive entrance, cobbles and pebbles around the house with small mediterranean shrubs, and a lovely small tree, Amelanchier that greets you as you turn the corner into the main garden. In all a modern good looking garden fully functional for a modern family.